This is a shot taken just around the corner from my house. It shows the River Jordan, where the young John Illsley fished for sticklebacks. I feel a controversial bestseller coming on: Did Jesus Come From Market Harborough? A later post discusses how the River Jordan got its name. Indeed He did, as quickly as he could. But Jonathan - the River Jordan is deep and wide (and be chilly-and-cold). This is not at all what I had expected. 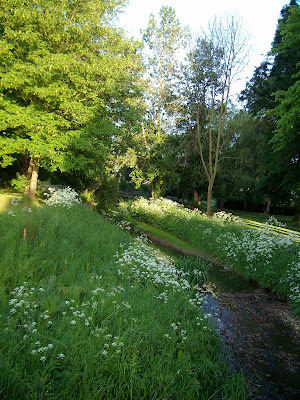 I would like to use your photo on my blog this April in the A-Z Challenge when my theme will be British Rivers I came from Rutland originally by=ut did not know the R Jordan in Northants existed. My blog is at bob.scotney.blogspot.co.uk Bob's Home for Writing. Hope you will agree. Hello Bob. Many thanks for asking first. You are welcome to use the photo as long as you credit me and include a link to the blog. Thanks Jonathan, Will be happen to give you credit and provide a link to your blog.